For news, views, special offers & life-changing ideas, register here. Does it make any difference whether we breathe in through our nose or our mouth? No prizes for the correct answer but I will explain the difference. And there is one. A big one! Until a few years ago I’d have gone along with there being little or no difference between the two. After all whatever passage we use to inhale, the oxygen still gets to our throat and eventually our lungs. Visiting Singapore last month we made sure we had plenty of time to meet our friend Japanese Natural Health Practitioner Mr Oya Seiiciro. We love meeting with his as he speaks with complete authority and we always come away with our heads full of new information and ideas. • A lady in Singapore with chronic tooth grinding. • An Australian dentist’s wife who’d snored loudly for several years. • A 36 year old female makeup artist from Taiwan who underwent brain tumour surgery when she was only nine years old. The left side of her face was paralysed and she experienced the symptoms of Bell’s Palsy (the muscles on one side of her face became weak and her face drooped). • A five year old in Kuala Lumpur who was born with Down’s Syndrome and spent her early years at a special needs school. Every day these conditions affected the way they lived their lives. Every single day. Painful jaw movements, sleeping apart from partners (because of the noise! ), furtive looks from strangers and those special needs schools. Nothing they or the medical profession did could help them break free from these afflictions. The good news is that all of the people in these examples have either significantly or fully recovered from these conditions. The lady in Singapore no longer grinds her teeth. In fact it took only 15 days to break the habit. And during this short time her face noticeably slimmed. After only 3 days the Australian dentist’s wife started breathing through her nose, the catalyst she needed to stop snoring. The 36 year old female makeup artist from Taiwan was told by her plastic surgeon that after only 2 months her smile had noticeably improved. Impressed with the change he encouraged her to continue with what she was doing. 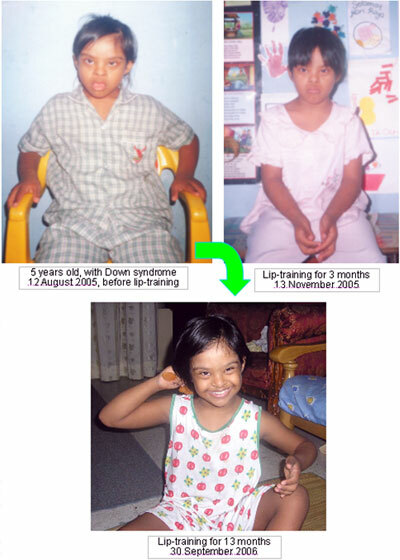 The 5 year old in Kuala Lumpur with Down’s Syndrome has since demonstrated a remarkable recovery. She now enjoys normal breathing while sleeping, her face is no longer chubby, her body posture is more erect, she hardly ever gets sick or has flu and her classwork has improved (she can draw a human face without assistance). After using this simple technique to change from mouth breathing to nose breathing she can now talk fluently. What’s actually going on to bring about these recoveries? Is it really all about the breathing? The act of breathing through the nose instead of the mouth brings about one vital change. It raises the position of the tongue. This movement alone allows greater volumes of oxygen into the brain and the body. Look at the image below of a person lying down and see how much difference the position of the tongue makes to the air passage. If you look at the mechanisms we use to inhale and exhale through the nose it’s clear that there are many health benefits to be had from consistent nose breathing. The converse is also true. Mouth breathing bypasses important stages in the breathing process. This can lead to many health problems, not the least of which includes snoring and sleep apnoea. Mouth breathing is common in individuals whose nasal passages are blocked or have in some way become restricted. Having read that you may want to re-evaluate the medical approach of taking pills for a stuffy nose, sinus support, nasal congestion and breathing easier. While this provides billions for the pharmaceutical companies, at best these approaches only mask the condition. None of the remedies I’ve seen address the underlying cause. Mouth breathing can also impact the shape of a developing child’s jaw position and face, in particular inducing long narrow faces with regressed cheekbones. Any teeth emerging from the jaw bone can become crooked and the resultant smiles will display much of the surrounding gumline. It can also can impact the way the tongue works, something known as “tongue thrust’. This affects the actions of speaking, swallowing and chewing. Children are already at a self-conscious age and vocal impediments can deepen any existing, negative responses, requiring the work of a speech therapist to correct speech impediments. I’ve had friends tell me they tape their mouth at nights to stop the snoring with seemingly good results - that is until the tape is removed and the snoring starts again. This method may prevent nocturnal noise but isn’t training or strengthening the muscles around the mouth. Another colleague learned the Buteyko Method of Breathing to reduce his snoring and sleep apnea with some good results but the process took him some time to learn and put into practice. For a while my colleague also used Oxygenated Water. This is an unusual water that doesn’t contain any oxygen. It contains a particular chemical, which, on contact with stomach acid, breaks apart and releases oxygen molecules that enter the bloodstream. As the reliability of this process depends on the amount of stomach acid you have it could be more miss than hit. I want you to consider this…. In 1931, Dr. Otto Warburg won the Nobel Prize for work proving cancer is caused by a lack of oxygen in your cells. In his book, The Prime Cause And Prevention Of Cancer he wrote: “The cause of cancer is no longer a mystery, we know it occurs whenever any cell is denied 60% of its oxygen requirements”. So any method that increases the amount of oxygen you breathe helps contribute to the prevention of cancer. Breathing is not a skill we learn. It’s one thing new-born babies are far better at than adults. It’s those years in between where we un-learn all our good breathing habits. To breathe is to live and to breathe fully is to live fully. The natural, full-body breathing we are born with becomes compromised as we cut ourselves off from our feelings and emotions - most often to survive the traumatic challenges of childhood. The result? Chronic shallow breathing reduces our breathing capacity to one third of its potential. The effect of that? Diminished exchange of respiratory gases that in turn reduce our cellular energy depriving us of many health-giving actions that natural breathing would have in our inner organs. Based on the specific apparatus and mechanisms by which we inhale, nose breathing offers several health benefits, specifically increased blood circulation, improved blood oxygen and carbon dioxide levels and better lung volumes. The name ‘Patakara’ was derived from papa.... tata.... kaka.... rara.... sounds that Speech Therapists use for patients to pronounce key words in speech training. So the device was developed originally for patients who suffered from strokes. Breakspear Medical Group’s Specialist Autonomic Neurophysiologist, Dr Peter Julu, suggests that the Lip Trainer may activate the seventh cranial nerve nucleus in the brain stem. This sits near the area that can modulate sympathetic and parasympathetic nervous systems and thus have effect on immunity as well. Now being studied by many health groups around the world the Patakara Lip Trainer has been used since 2000 by over one million people as well as by hundreds of Doctor’s and Dentist’s Clinics, Hospitals and Rehabilitation Centres in Asia. Outside Asia it has in recent years become a popular device with Speech Therapists, Neurodevelopmental Practitioners, Sleep Disorder Therapists and Back Pain Specialists in the UK, Europe, Australia, Canada and the USA. "The nasal cycle, which is part of an overall body cycle, is controlled by the hypothalamus. Sympathetic dominance on one side causes nasal vasoconstriction of the ipsilateral turbinate, while parasympathetic dominance on the other causes nasal vasoconstriction of the contralateral turbinate. Increased airflow through the right nostril is correlated to increased left brain activity and enhanced verbal performance where as increased airflow through the left nostril is associated with increased right brain activity and enhanced spatial performance." What may be interesting is that the nose is host to over 50 species of bacteria. As is the case with bacteria, if all goes according to plan, the ‘good’ ones tend to triumph over the ‘bad’ ones. But only if we nose breathe! The moment we start to mouth breathe the ‘bad’ bacteria dominate, causing such conditions as Staphyloccus Aureas infections. What can the Lip Trainer do? benefiting conditions including Down Syndrome - behavioural issues - attacks of epilepsy - stroke conditions - creation of synapses in newborns - mental alertness - aphasia - dementia (Alzheimers and Parkinson's) - brain damage - mental rehabilitation. Bell’s Palsy - drooling - bleeding from the gums while brushing - bad breath - mouth ulcers - excess phlegm - dry mouth - teeth grinding - sagging face - double chin - stiff neck - fine wrinkles - TMJ (temporomandibular joint) disorders such as alignment of teeth. benefiting conditions including speech and articulation disorders - swallowing disorders - snoring - obstructive sleep apnea - breathing difficulties - blocked nose - hypertension - irregular heartbeat. benefiting conditions including common colds - unidentified coughs - shallow sleep - toilet visits at night - bedwetting - atopic eczema - bowel and bladder issues - asthma attacks - menopause - depleted immunity - rheumatism - diabetes and blood sugar levels - kidney conditions - Sjogren’s Syndrome (an immune system disorder). How does the Lip Trainer work? Inserted in the mouth to fit under the lips, the user exerts pressure to keep the lips together. The result is a strengthening of the facial muscles which encourages breathing through the nose rather than the mouth. Saliva is prevented from evaporating and problems such as mouth ulcers and bad breath are either kept at bay or reduced altogether. I mentioned this young girl earlier. The images speak volumes. Children with Down’s Syndrome were born without developed facial expression muscles (ie weak strength of lip closure). Consequently their faces have a similarity - an open mouth, a chubby face with conditions such as sleep apnea, difficulty swallowing, speech disorder and hearing difficulties. When Down Syndrome sufferers start to exercise their lips to strengthen their orbicularis oculi muscle, there will be a recovery of those symptoms. The girl’s father said at a special needs education conference in Kuala Lumpur, Malaysia that his daughter developed the ability to talk using the Lip Trainer and after 3 years of its use can now speak fluently. Breast is best! A report from the Singapore Government shows that 85% of Singaporeans have gum disease because the incidence of breast feeding is low. Feeding from the breast is where the orbicularis oculi muscle of mouth develop; this is not the case with bottle feeding as considerably less sucking is required with the latter. When children who were not breast fed become adults, their weak orbicularis oculi muscle will very likely cause them to sleep with an open mouth. Gravity and age are generally believed to occur together resulting in a sagging of the facial skin. This is reversible as the ‘gravity’ aspect is merely the facial muscles becoming weaker. Use of the Lip Trainer will tighten the facial muscles as well improving breathing. The speech therapists at the Okuno Hospital (Tokyo) announced, for the first time that: "The dementia (Alzheimer) can be improved with the Lip Trainer Patakara". Blood flow to the frontal lobe of the brain increases when lip exercises are carried out with the Lip Trainer. The brain works as an energy source. It is normally found that the function of the brain decreases in those with Dementia as blood flow to the brain has decreased. There are four parts of the brain, the frontal lobe, the parietal lobe, temporal lobe and the occipital lobe. It is believed that with dementia, blood flow to the frontal lobe of the brain is first to be reduced. A client’s mother (74 years of age) had been a dementia patient for ten years. She had lost the ability to perform simple physical tasks without supervision. After using the Lip Trainer more then normal (6 times a day for 6 minutes each time) her motor skills returned, she could count to ten without missing out any numbers and she could understand and respond to instructions with greater ease. 5. Mouth ulcers People suffering from painful mouth ulcers have reported that, after breathing through their nose, their ulcers stopped almost immediately. The reason for this is that nose breathing allows saliva to be retained in the mouth at night and saliva is key to the prevention of mouth ulcers. If your body is healthy, saliva is indeed the best mouthwash available, far superior to the damaging commercial mouthwashes advertised on TV. Those trips to the toilet in the middle of the night will decrease within a few weeks and then hopefully stop altogether if you use the Lip Trainer correctly, 4 times per day. These disturbances are caused by an imbalance in the autonomic nervous system that create shallow sleeping patterns. The increased cerebral blood flow brought about by lip-training will stimulate a deeper sleep and help release antidiuretic hormones from the pituitary gland reducing or eliminating altogether any need to visit the toilet. Mouth breathing allows bacteria to enter with each air intake. This dries up the saliva. While bad breath is generally caused by bacteria in the throat as well as trapped food between teeth, we now know that gum disease and ‘furry tongue’ do not cause halitosis as we have been told. If you could sleep with your mouth closed, the bacteria that causes bad breath will be absorbed by saliva each night. Any bad breath could be reduced or even gone in as little as 2 weeks. The spoiling of teeth is exacerbated by mouth breathing as the protein membrane on the surface of teeth becomes dry, cracks and discolours. When Lip Trainer users successfully change to nose breathing and started lip-exercising regularly, they wrote to let us know these conditions listed above were resolved. The main cause of the symptoms were largely caused by mouth breathing. 80 % of bacteria are filtered out when nose breathing. There is a correlation between volume (size) of nasal chamber and strength of facial expression muscles. Mouth breathing when asleep and a lack of strength of the facial expression muscles can bring about a shrunken nasal chamber. This can be exacerbated in those who have had ENT operations to straighten or enlarge nasal channels. To reduce or stop a blocked nose consciously change from mouth to nose breathing and strengthen the facial expression muscles. Snoring is just your body’s way of telling you you’re not getting enough air. Many snorers have swollen soft tissue around the pharynx, brought about by years of mouth breathing. To stop snoring it may take anything up to 6 months of nose breathing and lip training to reduce the swelling. The snoring sound is caused by the speed of exhaled and inhaled air passing through the narrow passage around the swollen pharynx or at the root of the tongue when the passing air causes it to vibrate. 12. 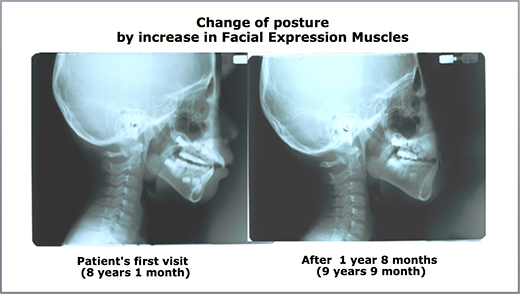 Posture A child’s posture can be affected because of facial and skeletal issues linked to mouth breathing. In order to breathe more freely, the airways must be fully open, yet this can be difficult when the shoulders are hunched and forward-leaning (common these says with daily mobile phone use). Posture can be improved using the Lip Trainer. Strengthening the muscles of facial expression (especially the cheek muscle) will directly affect the muscles at the back of the neck. If you’re suffering from a condition, especially a long-term condition you now know what to do to help stop the rot. More and more people are awakening to the harsh reality that the medical pharmaceutical industry doesn’t make money out of cures, it makes money out of treatments. There’s a choice of staying on the same path and soldiering on or doing something positive about it to recover your health - just like the lady in Singapore, the Australian Dentist’s wife, the make-up artist from Taiwan and the 5 year old from Kuala Lumpur. Exhaling is expiration; inhaling is inspiration. Lip Trainers are available here We ship internationally. People occasionally ask if there is an alternative approach such as breathing exercises. There are many yoga breathing techniques and disciplines such as Butyeko Method (which proposes the use of breathing exercises primarily as a treatment for asthma and other respiratory conditions). These are extremely effective and I wholeheartedly recommend them. My personal preference would be to use the Lip Trainer not only for a faster response but also for the long term benefit of having stronger orbicular (lip) muscles. As you read this, your cells are suffocating. You probably aren’t aware of it but they’re gasping for air. For one-third of the day (ie when you’re asleep) you’re not getting enough of the vital, life-giving oxygen your cells need. Why? Because you’re sleeping with your mouth open. If you think that sounds a little weird, you have to read on. Your energy is renewed as you sleep. The storage battery of muscle energy and thought energy is not charged and re-charged by food, but in the bedroom. Food is to the human body what the soil is to a plant - merely raw material. ; tissue elements, to be built into the organism, but not in any sense a source of life. If while you sleep you are not allowing yourself sufficient intake of oxygen to your cells, your health suffers. There's a fundamental point here: oxygen is the source of life to all cells. Your health is threatened when your body is overwhelmed with high concentrations of free radicals. Antioxidant enzymes do a great job of protecting your cells from damaging free radicals but those cells need oxygen to get the most out of the antioxidants. They work in tandem. Insufficient oxygen and….well, you guessed it! Increasing your intake of oxygen with each breath can add years to your life as well as improving your physical appearance. Let me put it another way: oxygen deficiency is a major cause of cellular breakdown. Your cellular health determines the speed at which you age. So when your cells break down, your body breaks down (with those unwelcome hormone imbalances). You need to help your cells breathe better. You need to deliver more oxygen to your cells so they can produce more energy and operate better, for longer. The good news is you can increase your oxygen intake in as little as 6 minutes a day. Do you (or your partner) breathe with open mouths (especially at night)? If so you’re starving your cells of oxygen.....daily. As a planet we're now suffering from a depletion of oxygen levels in the atmosphere as well as in our oceans. Oxygen therapies are becoming more important than ever before. Ambulance crews regard oxygen as a lifesaver. Dr. Otto Warburg, best known for his pioneering research on the connection between oxygen depletion and cancer. Starved of oxygen, the body will become ill, and, if allowed to persist we die sooner than we anticipated.. The more oxygen we have within us, the more energy we produce; the more healthy we become. It’s that simple. It's also time we reversed this trend. My snoring was stopped in the day after buying lip trainer the day before, it was very helpful! Let me carry on use it in order to verify the effectiveness to the other my symptoms. Thank you very much for this time.